Saul and his son Jonathan lead attacks against the Philistines, with his son’s group overcoming the enemy in the first fight. Everyone gives Saul the credit, and as they progress they get to a place where Samuel is supposed to meet them. Samuel is not there on time, so Saul decides to take matters into his own hands. He is afraid of the Philistines, is not trusting the Lord, and the people are scattering from him. So, he does the offering to God himself. Samuel arrives as they finish, and is appalled at Saul’s foolishness. Saul says he “forced himself” to do it, which is utter ridiculous malarkey, I think. Samuel tells him his continued wickedness has lost him the throne for his heirs. They all continue up to battle the Philistines, but only Saul and Jonathan even have sharpened weapons because the Philistines kept blacksmiths out of the towns the Israelites are overtaking so that they could not get weapons sharpened. We must always obey God. We may be like toddlers, not understanding the why of the rules, but if God has told us to do something we will find it far better, in fact the Best, to do just that. I want to have a heart like that of David, who also was an imperfect and broken man. But he was a man after God’s own heart. I want to have a heart that follows after God in all things, too. Before we jump on the wagon of judging Saul, think about your own impulses. In a tight spot, do you wait for further instructions from God? Or do you make a decision and pray about it going well later without ever hearing God say what to do? My own example of this is that in Lebanon our son had almost died and we were trying to find a language school. Everything was saying that we would have to put him in daycare five days a week all day long just to attend one or two language classes a week. I was so upset, but I was feeling pressured into this “only option”. But as I stopped and prayed, I knew that God had told me to be a Stay at Home Mom for the first 5 years. While I still don’t know how that figures into daycare and school in the future, I knew in my time consulting God that I would not be putting Davy into daycare, and I would not be attending that language school. We were overdue in getting back to the language school, and yet, we stopped to ask God for directions before running down a path that would not have been best for our family. That same day that I had decided this, Louis came home with a private tutor’s phone number. She is the woman we have been tutoring with ever since, and we are blessed beyond belief by her. It really was best. But in the moment it seemed as though we were doing the wrong thing putting off our decision. But wrong from the perspective of a language school that we did not participate in, so no harm was done to them either. God has a plan for you, too. Do you know what it is? After the battle is won, people still want to punish, so they want to go against the men who didn’t think Saul could be their king. Saul does not allow the men to be put to death because the Lord has saved them again. Samuel tells them to go to Gilgal and renew the kingdom, so they again make Saul king and they celebrate. Then Samuel reminds them of the great sin they have done by choosing to have a human king over God. The people hear him tell of the history of the Lord’s providence and saving them over and over when they were in situations brought about by their turning away from God. They finally seem to understand that they have sinned greatly. 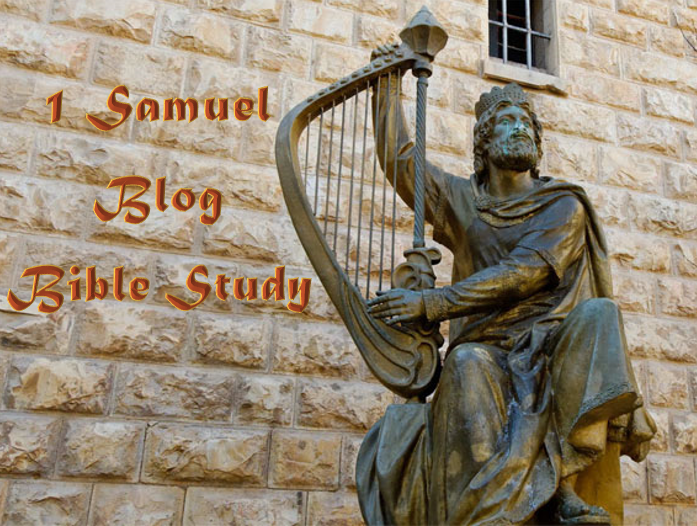 Samuel reminds them not to do it again out of their discouragement, but to turn to God with their entire lives. Samuel also assures them that he will continue to intercede for them as God as tasked him. The chapter ends with Samuel again warning them to stick with God or be swept away along with their king if they turn back to wickedness. Samuel is in a position much like Moses, he hears from God and then tells the people what He says. Here he is assuring them he will continue to seek God, stand in the gap, intercede, pray for them. He also says it would be sin not to. It is our job as well to pray for people in our lives. To pray continuously, in fact. But I know that there are many people I struggle to pray for. Whether it is because I am mad at them or their decisions, or feel so lost and hurt by them, or cannot understand them. Whatever the reason, if God has told me to pray for them, it is sin to not pray for them. As I read these cross references, too, I realize that my prayers matter in ways that may not be me controlling anything through prayer. I will be able to stand before the people though and show I have done no wrong before them as Samuel does in this passage. Because in prayer God will reveal to me my own sins I will have to deal with those things so that I can live a life that is focused on God instead of blinded by other people. If you have any of those people, please write them down in a place you can see, and take time every day to pray for them for one month. Write down notes of what God tells you when you are praying, and after a month reflect on your own heart. You are most likely to change in this time, for the better, of course. Thank you for reading. I am excited to hear your key verses, observations, and thoughts! Please take a moment to leave a comment to share with us. I just finished going through this entire book. I kept track in scrawlings and notes and journals as I worked toward the goal of changing my attitude to that of joy toward cleaning our home. The steps truly did help me. Crystal Paine is one of my favorite bloggers, as many of you know from my constant reference to her posts. This book was perfect for me since my word of the year is Discipline. I had seen it so many times as I looked up Crystal Paine articles, and I finally bought it and I am so happy I did. The success I achieved in the past 21 days was amazing! This book takes one big project you would like to get done, and walks you through accomplishing it alongside your real life. Each day there is a practical “mini-project” which will help reframe and prioritize general pieces of life to help you thrive. The big project gets done in 10-15 minute segments each day. My Mega Project for this first round was to change my attitude toward cleaning our home to one of joy. This is am impossible task to measure, but in reflecting I grew so much in that area. We have a usable cleaning schedule that everyone has a part in, and it looks nice, too. We have made cleaning a habit, and laundry getting done one load per day has been another lifehack habit I have mastered. I even saw the bottom of both hampers in the last week! As soon as I finished the official 21 days today, I actually sat down and started the whole process again for a new Mega Project! Crystal mentioned using the book over and over as a way to reinforce habits. I made myself an Excel document that I can use over and over which will include revisiting the mini projects. My new Mega Project is to create a book challenge of my own for 2017, and one for both kids. This will include building bookshelves. I am very excited, and I know that this is one of those ideas that would have been exciting to start, burned me out, and never gotten completed. However, by breaking it up into bite size pieces, planning in days to reevaluate the steps, and determine if I need a little longer, I know I will stay motivated. If you have a part of your life you are hoping to tighten up, a goal you can accomplish in three weeks, or you just want to think through discipline in your own life, I recommend this book to you. Kyrie started walking! She took her first steps on June 7th. She thought it was weird, but tried again a few times. June 9th she stayed up late just practicing! She thought it was so funny, and she would often get so excited about having walked that she would crawl a lap or two as fast as she could from one end of the house to the other laughing and squealing with joy. Davy, of course, is extremely excited for her and he tells her, “We knew you could do it!” He is a wonderful big brother, and is loving his new job of watering the plants on our balcony. He is quick to learn and is able to point out dead leaves to pluck. Use a Timer for Cleaning Time I can’t even count the number of times in which I post about a goal that is going so well, progress being made, only to come to a complete stand still the following week! This has been the case this week with so many of my goals. However, my perspective has been moving slowly and steadily closer to God’s own view and I am finding more and more peace in what I perceive as failure, but God perceives as something else. I am still trying to understand, but God is with me. This week, the cleaning hit a few walls, one of which was hurting my leg so that it hurt too much too stand and do dishes. However, in Louis taking over dishes and making me take some sick time, I was able to review my cleaning methods, different things I have tried, and come up with a usable cleaning schedule. It is prioritized and everything! I am so excited to start using it on Monday. Sweep the Floor and do Dishes After Every Meal Davy clears his place after every meal, and with Louis and I clearing our places as well we have even been able to wipe down the table after meals! I may write more about these books in a future post, but since my writing has come to a standstill with interns here I will share a little about my Mega Project, which I feel like is well under way. For me it isn’t the cleaning as much as the attitude I carry. I have felt hopeless about cleaning pretty much since moving into this apartment 3 years ago. Moving here with 2 kids this time made me even more wary knowing how much harder it will be. However, I know that God will help me in my weaknesses. So, I am clinging to faith. Now I have to release this bad attitude about cleaning to him. Both of these books are helping me release and work toward a happy home. My Mega Project was hard to put into words two weeks ago when I started the book. “I want to have a different heart about cleaning, and feel like this is My Home.” That was about all I could say about it. I am still struggling to truly put it into words, perhaps that should be its own post. To begin with I found a list of 20 minute per day tasks to get a house clean in 31 days. So, basically a month long project to get the house clean. Then I repeat those 31 days every month, with a few added projects the following months, since the house will be relatively clean to start from. As I work through I have been writing my reflections, revising the list, and this past week was able to create what I think is a wonderful reusable Daily, Weekly, and Monthly way to do the cleaning the way I want it done. A History of the Moravian Church by J.E. Hutton 75% – 77% = 2% of the Entire Set, I read 15% of Book 3. The Gospel of John Volume 2: The Daily Study Bible Series by William Barclay 4% – ??? Louis and I read a lot of this, but I don’t have the book with me to figure out how much. 27% + 53% + 15% + 10% + 7% + 48% + 6% = 1 2/3 books over the past two weeks. Start a new “fun” book. Not a book, a website, I have been reading Apartment Therapy posts each night before bed. Continue reading each day. Take the time. I spent a lot of time the last two weeks researching. Researching calms me in a way almost nothing else does. I researched cleaning, waste management, vermicomposting, and helicopters. This involved a lot of very engaging reading, and some of it was from blogs in which I could go and purchase the book to make it “count” toward my reading challenge, but instead I just read for free, had fun doing it, and rejoice in the peace and joy I felt through it. Additionally, the kids and I had many many reading marathons. As I am reading a book on creating a reading program for my children at home I have felt increasingly that I want to just read to them whenever they want, so we have been. Kyrie even brought a book to the hospital for her vaccination and check up. My goal for writing this week is to consider it Bonus if I get to write, and to not feel guilty for not posting blogs. I did not feel guilty. I did a lot of research on things, and so will probably start to write as I need to process. I have been writing (BONUS!) by creating the Cleaning Schedule, going through One More Step and 21 Days to a More Disciplined Life, and planning our upcoming visa trip. These were great calming and coping strategies for me the past few weeks. I may turn a little of it into blog material eventually, but as I am learning about my role of being “Just” a stay at home mom this year, owning the “just”, rejoicing in the freedom of being able to read, write, or just stare at flowers for a long time, storing up resilience, being wooed to God’s side, getting to know my kids, I am not burdened by blogging. I love sharing with you all, so I will continue, but I have been able to release it to God as well. So freeing! I didn’t actually accomplish all the videos. One day I sat for an hour with no internet, so I worked on a project for Louis instead and we went for a big walk in the evening. Another day Davy walked into me lifting a dumbbell and so I stopped working out to care for his head which had a huge bump from the dumbbell. I used Spark People to calculate the time I should use as a goal if I end up using stair climbing or a walk as my exercise instead of the video and I was able to match that the first week. The day that I hit Davy with the dumbbell was the same day I got this huge bruise on my leg (possibly from him kicking me while I iced his head), but I kept pushing and we did two big outings with lots of walking and lifting, but the day I am writing this I have been in bed all day with it throbbing, only dulled by the ibuprofen. So, I am going to take some time this week to heal. Perhaps I will do arm exercises or abs, but even moving my thigh last night was hurting my calf, so I will be cautious. Measurements, Pictures, and Weigh In It turns out this coming Monday, June 13th is the day for my weigh in. Bikini Body Mommy recommends 15 day intervals. So Monday I will weigh in and do pictures. Hopefully Louis can keep my bruise out of the pictures. This week begins the use of my new cleaning schedule. Use a timer (iPod mix) for 20 minutes in the morning, post workout while I cool down. Complete this cleaning time by 3pm each day. Use timer again for cooking dinner & a 10-20 minute clean of what is left on the list. Continue to Journal through the two workbooks One More Step & 21 Days to a More Disciplined Life. Take it slow. Do not overuse my leg that is still hurting. Workout Plan: If my leg hurts on my grocery trip at the beginning of the week, then I will modify to do only upper body and abs throughout the week. 2. Take time to calculate progress during this Challenge 4.0 which is almost completed. Saul had gone back to his home to continue working in the fields, and in Jabesh-gilead the Ammonites came to take over their territory. They make a deal with the Ammonites to try to get help or let the Ammonites enslave them and cut out all of their right eyes to humiliate them. They send messengers through Israel and those they tell in Gibeah (where Saul lives) are grieved by this plan, and Saul finds out about it leaving his field. The Spirit of God comes upon him again, and this time he does something about it in the form of taking action against the Ammonites. He cuts up oxen to send all over Israel as a sign of what he will do to the oxen of any who do not join him in the fight. This sounds a lot like what Samuel said would happen. Men come with Saul and Samuel and they attack the Ammonites thoroughly, leaving no two together afterwards. Quite the excitement happening here in these eleven verses. Déjà vu it seems in our new verse of the previous chapter. Except this time he does something about it by taking on the Ammonites and destroying them. Saul didn’t seem to be chasing after God from the time of his prophesying in chapter 10, or even after being proclaimed king. Instead he has returned to farming. If I was the new king I would hope I would start off by trying to reconcile at least myself with God since choosing a king has shown that my people are against God being the king. Instead Saul just goes on with his life as though nothing is happening new within him. Perhaps there is nothing new in his heart and he did not want to pursue the Spirit of God in his life. There are many people in my life who have had an experience with God or Jesus Christ and have not wanted to pursue. For me, I can’t live without Him and one taste is not enough. I hope that you can say that, too, that you are desperate for more of God in your life than just one taste. If you feel convicted by Saul’s pattern of behavior, perhaps this study is your beginning of chasing the Spirit of God for yourself. There have been people I have watched have an experience with God and even begin attending church, getting involved, volunteering, pursuing the activities, and it is exciting to see. Yet, what matters most is the heart. Is this outward change for the relationships around or is there an inward change as well with a growing relationship inside with our Savior? This is not something that can be judged except between me and God, you and God, and each person and God. I know that I am destined for Heaven, that I have a relationship with God, have been forgiven, and the internal changes are happening. Here it is put into a prayer for you, fill in the name(s) on the blank spots. I bow my knees before You, the Father, from whom every family in heaven and on earth is named, that according to the riches of his glory You may grant _________ to be strengthened with power through Your Spirit in ________’s inner being, so that Christ may dwell in his/her heart(s) through faith—that ________, being rooted and grounded in love, may have strength to comprehend with all the saints what is the breadth and length and height and depth, and to know the love of Christ that surpasses knowledge, that __________ may be filled with all the fullness of God. Amen. We begin this section with Saul finally returning home from his journey to find the donkeys. He tells his uncle he went to see Samuel. When his father asks what Samuel told him Saul only tells him about the donkeys instead of sharing the whole truth that he will be the first king of Israel. Saul, having not killed the Philistine garrison, continues to decline the instructions given to him from Samuel by not meeting Samuel. Samuel calls the Israelites to meet and they cast lots for king of Israel. Of course, Saul is chosen, but he is hiding. When he finally is found through God’s directions he is taller than anyone. Samuel writes out the rights and duties for kings before sending everyone away. Men went with Saul to his home, but others complained that Saul would not be able to save them. Saul, Saul’s uncle, Saul’s servant, Samuel, the people, the Lord, the Egyptians, all the kingdoms that previously were oppressing the Israelites, men of valor, and worthless fellows. Sometimes we get what we ask God for even if it is not best or even good for us. He allows us to make poor decisions, and hopefully we always seek God’s will for our lives because he truly knows best. Saul hid from his responsibilities, didn’t follow the instructions given, and God still made him king. God wasn’t looking for someone perfect. Since God was supposed to be their king there was no one else truly fit for the job, no one who could truly do the best by the people. Louis and I being missionaries sparks great excitement in people, whether excitement to tell us how foolish we are to take our family into the Middle East, or to find out how we have the courage to do this. But for us it is what God told us to do, so we are doing it. There is excitement for the adventure of following God, but for the most part it is simple direction following. We are not omniscient enough to be able to look at all the people headed for Hell in this world and to know where we can be most effective, so we trust God for that. And we trust that others around us are also going to follow God’s plan for their lives. There are plenty of people who CAN go to Lebanon, Haiti, Zambia, etc. but so many people think they can’t. I don’t go for this can or can’t attitude because it never has been based on whether we can or not. It has always been based on what God told us to do. If God has told you to do something, don’t hide in the baggage like Saul, just start doing it. You are not alone. Up to this point the application has been to find idols and barriers keeping you from God. If you have been discovering those, pursuing God to remove them, and continuing to seek God’s will, then now is the time to ask God what it is He is asking you to do that you might be hiding from, not understanding, or ignoring. Dear Jesus, help me to hear Your voice clearly. Help me to have no more excuses to hide among the baggage. I want to follow you with abandon, knowing that You have the plan fully in mind and I only know a piece of it. If You send me to defeat a garrison, or to prophesy, or to my next door neighbor I want to go. I want to go wherever You want to send me, Lord. Heal me from the callouses that keep me from feeling the extreme burden and pain of all the people suffering, dying, and ultimately damned around me. Give me a new heart that suffers for them and seeks to share with them the Good News of your forgiveness and a Heaven I want to share with them. As Samuel sends Saul and his servant on their way he takes Saul aside, sending the servant ahead. He anoints Saul and explains that God has chosen Saul to be over the people. Samuel gives Saul several prophecies for his trip home, and they all come true. God gives Saul another heart as he returns home, and Samuel says he will prophecy and be a new man while prophesying. God chooses Saul and David both as kings, shepherds, and leaders of Israel. But God is still the ultimate ruler. He is in charge of all things, sovereign. The way that these two lead obviously matters, as the last Psalm mentions David’s upright leading. We will come to see how both of them lead in the upcoming chapters. Being anointed sets each of these apart as chosen by God. These are people chosen by God rather than by other men. As a leader in our work, in our family, in our church, or wherever we find ourselves leading it is all-important to rely on God’s instructions at all times.